The days and weeks fly by so fast. I can’t recall exactly when I realized my daughter in pre-K would actually be signing in the school Christmas program; the major parts in the play were relegated to children in 3rd grade and above. I was expecting to have to dress my son, a 1st grader, in “Christmas best,” but I really wasn’t sweating his attire. I do know, however, it was precisely the morning of the day before the event that I decided I would make my daughter’s dress. Now, it just so happens my sewing space was in complete disarray on this day. I was having the attic barn wood painted white to lighten up the rather dim space. As I interrupted the painter to pick out fabric, she asked me if I had looked around lately. Everything was draped in plastic for protection from the over-spray. We both chuckled. I grabbed the fabrics I needed, a small cutting mat and a rotary cutter. 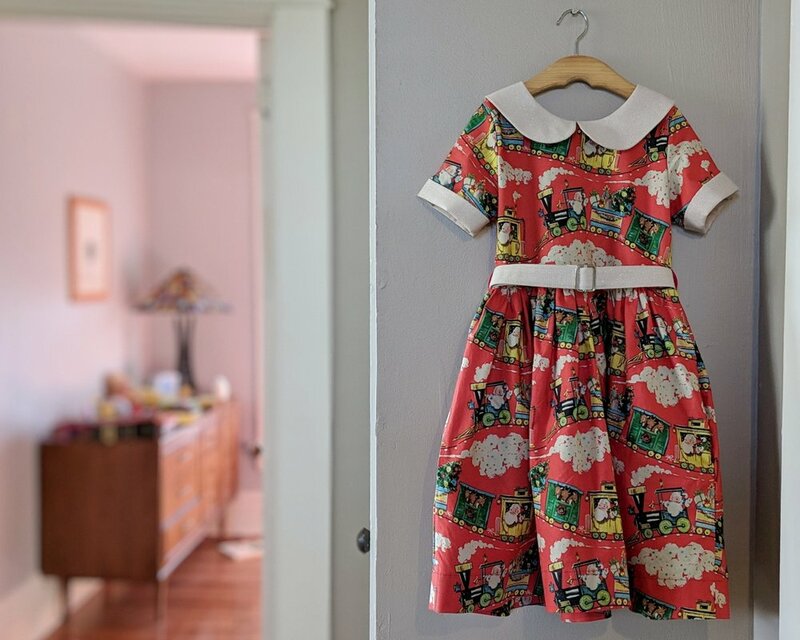 I had recently sewn two of the Simple Life Pattern Company’s Wendy dresses as a commission for sisters in TX. 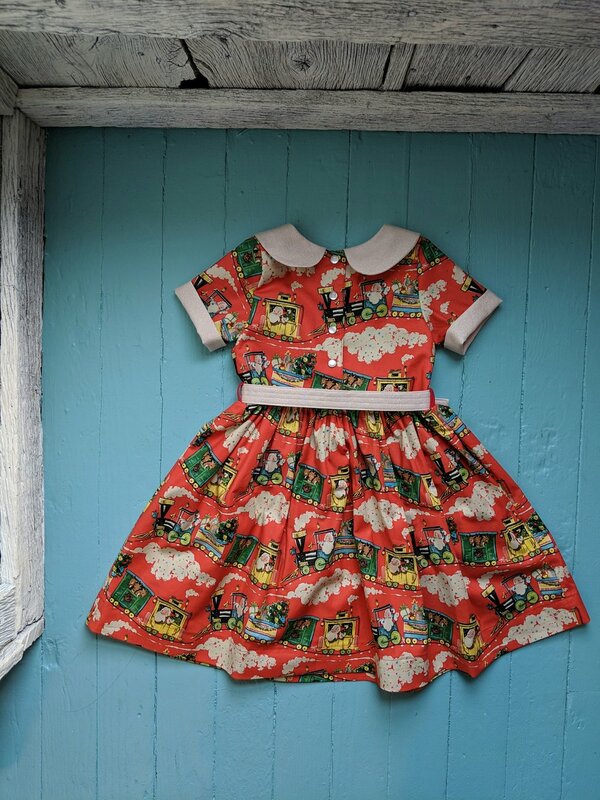 (Sewing Christmas dresses is such an honor!) Luckily the smaller of the two girls is exactly my daughter’s size, so the pattern was already prepped. I cut everything down on the dining table, like old times before I had a dedicated sewing space, with a toddler at my feet. The main fabric joined my stash, from best I can tell, in the fall of 2015. I remember buying some and wanting more yardage, so I had my mom purchase another few yards in Salt Lake City and ship it to me. I also recall that she was a bit taken aback by the price of about $10/yard. I’m sure that was rather expensive back when my mother was sewing clothing in the 60’s and 70’s. My mother passed away in the spring of 2016. I had pulled this Christmas fabric out with my other holiday fabrics each Christmas since then, but this was the first time I felt truly inspired to cut it. 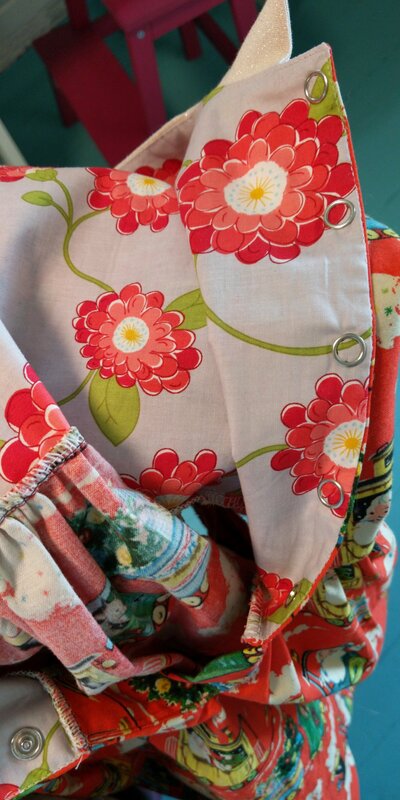 The bodice lining fabric is also a nod to mom. While the flowers more closely resemble zinnias, I like to think of them as red geraniums, mom’s favorite. This fabric was a short remnant from a mystery scrap pack and was exactly the height of the bodice and perfect for the job. I chose the accent fabric, a Cloud 9 glimmer solid, to coordinate with the only slider I had on hand for the belt. The slider is 1” wide, so I widened the belt to match and added some extra top stitching. I used pearl snaps for the closures in the back. And while I was pressed for time on this project, I certainly didn’t skip the inseam pockets. 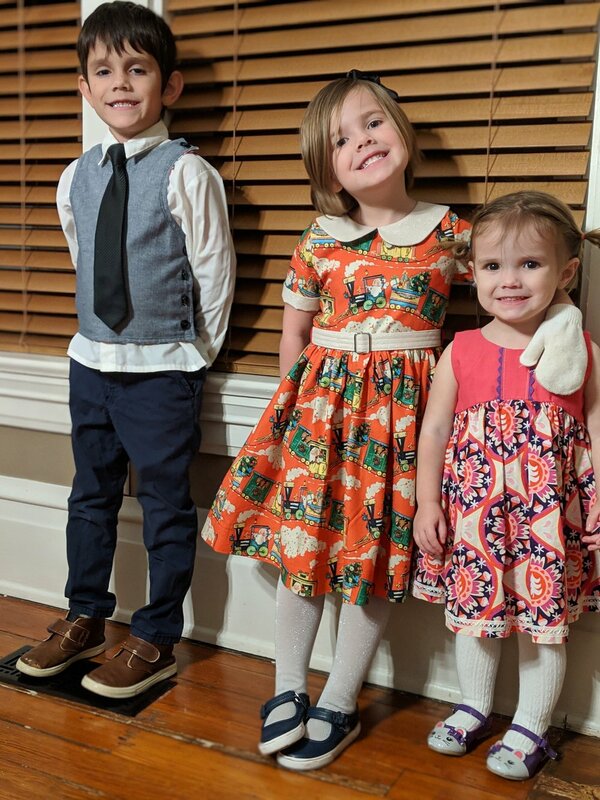 As per protocol, I lined up the kids for a photo before the event. Since the oldest seems to only be getting taller, he’s sporting a Hastings vest from 2 years ago over the same rtw shirt he wore for the Dickens Christmas program last year. The youngest is wearing a Sunshine dress I made 3 years ago, a last minute closet find. I had hoped to get more pictures in better lighting today, but so far my spirited middle child has refused to indulge me. I did even iron the dress in my blissful naivety. I was however happy to find the headband I thought she had lost and the family photo I had tucked in one of her pockets last night. The belt I also thought she had left at the theater was found on the floor near our front door. In lieu of more modeled photos, I took a few more hanging shots today. This one from our second floor hallway is my absolute favorite. The mid-century modern dresser in the distance was mom’s as well and is now used by my son, along with the matching bed. 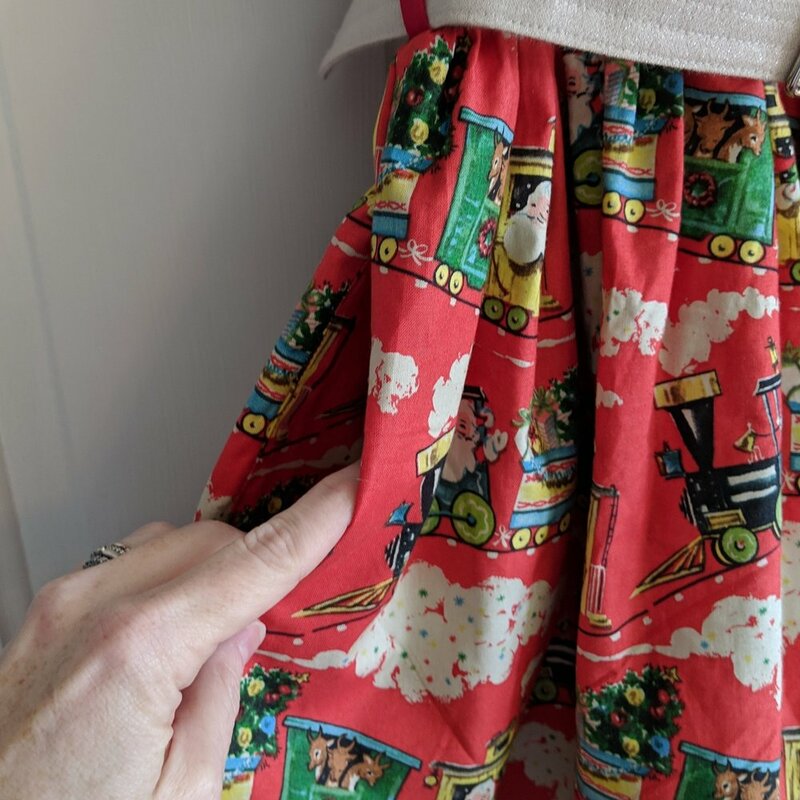 I really couldn’t be happier with how this dress turned out and I am looking forward to handing it down to the youngest and possibly their children someday. We miss you dearly, mom, but your presence is often felt.